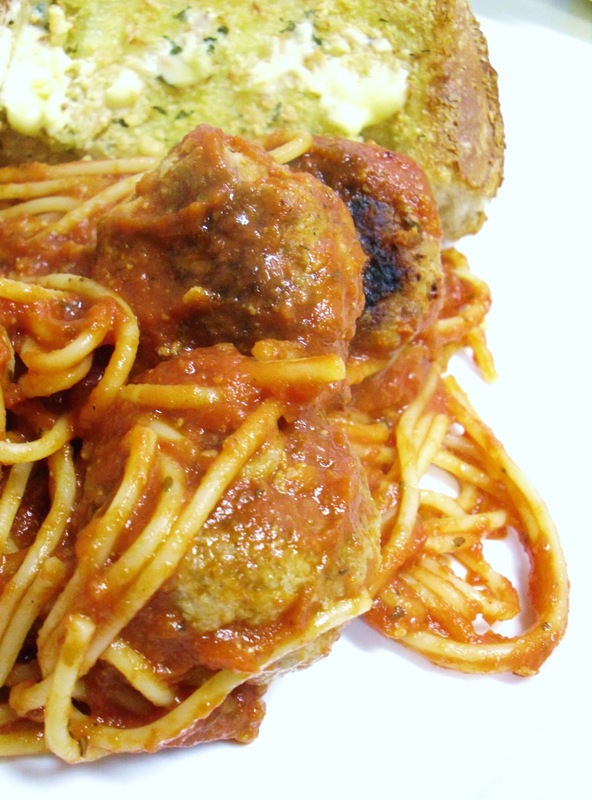 The other night, I revisited a classic: spaghetti & meatballs. Spaghetti & meatballs is actually one of my favorite comfort foods, there's nothing like a big fork-ful of pasta and a carmelized meatball. I try to make this a bit healthier with the use of lean ground turkey and whole wheat spaghetti. Many "light" recipes call for only using the egg white instead of the whole egg. If you want to watch your fat and cholesterol, you may, but I hate being wasteful (and I have nothing against the egg yolk). 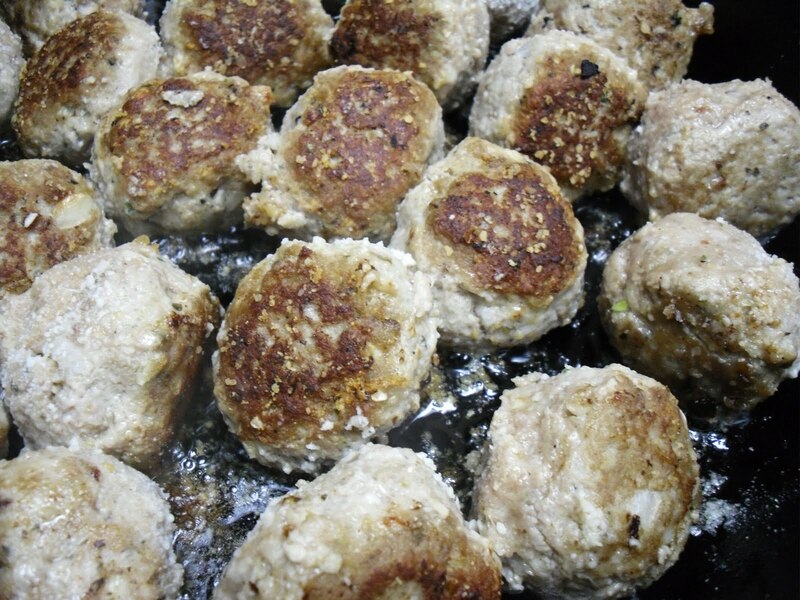 Rolling into about 2 inch meatballs, you will yield approximately 18 meatballs that will fit nicely into a 12 inch cast iron skillet. The whole meal should feed about 4 hungry people, or if you serve with a caesar salad (which I originally intended to but filled up a bit too much on spaghetti and garlic bread), you can stretch it to feed 6. This meatball recipe could be matched with either a white, due to its herb-y nature, or red. Avoid Chardonnays, as they do not like to be paired with tomatoes, and match up with acidic red such as Malbec or Sangiovese. 1. Cook whole wheat spaghetti according to package directions, making sure to salt boiling water before adding noodles. 2. In a large mixing bowl, combine first 13 ingredients (ground meat through grated parmesan), whisking the egg before adding. Mix thorougly until well combined (don't be afraid to use your hands). 3. Form meat mixture into 2-inch diameter balls using your hands. Recipe should yield about 18 meatballs. 4. Heat a few tablespoons of vegetable oil in a large cast iron skillet over medium heat. Arrange meatballs in pan so they are not touching. Allow to cook for a 5 minutes before quarter-turning. Quarter-turn meatballs every 5 minutes until evenly browned on all sides. 5. Meanwhile heat tomato sauce in a large pot over medium-low heat. Add cooked pasta. 6. 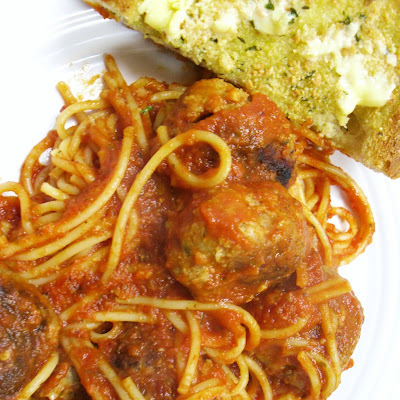 Once meatballs are cooked through (I usually select the biggest meatball to cut in half and check when I'm 99% sure they're ready), add to pot with spaghetti and sauce. Stir carefully to coat even with sauce. 7. 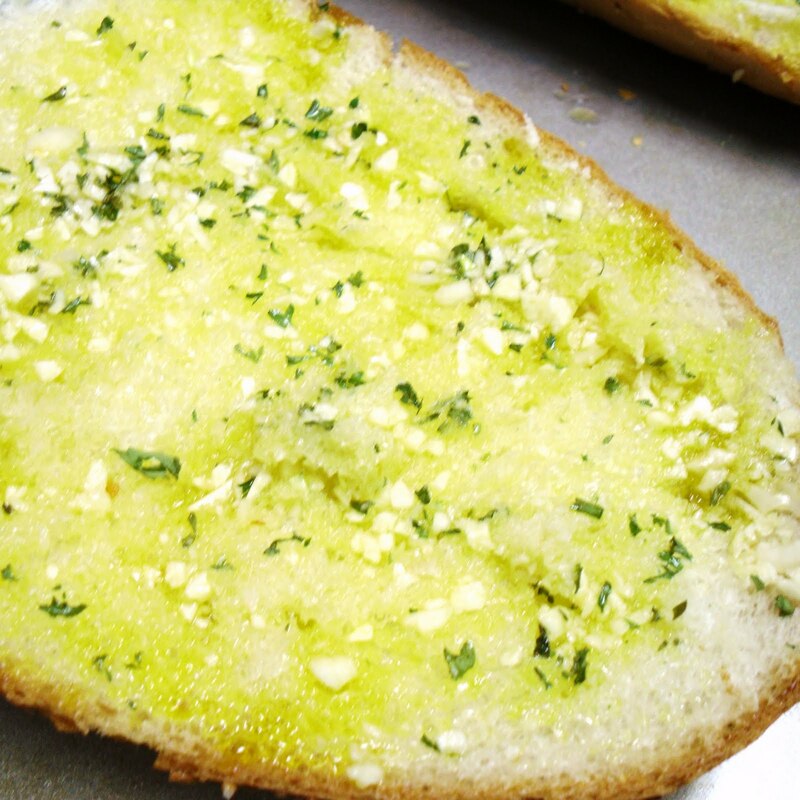 Serve with garlic bread and caesar salad! 1. Cut loaf of italian bread in half, lengthwise. 2. Brush on olive oil and melted butter, dividing equally amongst the two halves. 3. Sprinkle on minced garlic, dividing equally. 4. Top with grated parmesan, again, dividing equally. 5. Place garlic bread on shallow dish or cookie sheet. 6. Place under broiler for 2-3 minutes.